Please Log in to purchase! 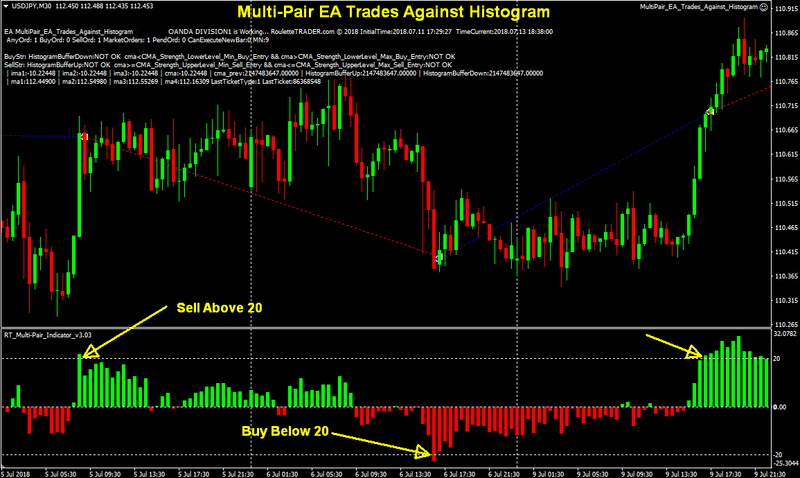 These Multi-Pair EAs trade signals from the Multi-Pair Correlation Indicator. These EAs are not available to anyone who does not own the indicator. Therefore, you MUST FIRST purchase the Multi-Pair indicator before you can purchase any of the Multi-Pair EAs on this page. To compensate for this, the EAs have been priced very low but I highly recommend that you get familiar with the indicator before buying any Multi-Pair EAs. CLICK HERE to purchase the Multi-Pair Correlation Indicator. There are multiple versions of the Multi-Pair EAs to trade different types of signals. To understand how each EA works, you need to understand how the different parts of the Multi-Pair indicator work. Some EAs trade signals following the histogram (the average of 3 correlation pairs) and others trade signals AGAINST the histogram. In the future, I will release several IMA-following EAs but those are still a work in progress. The EAs available now are based on signals from the Histogram. 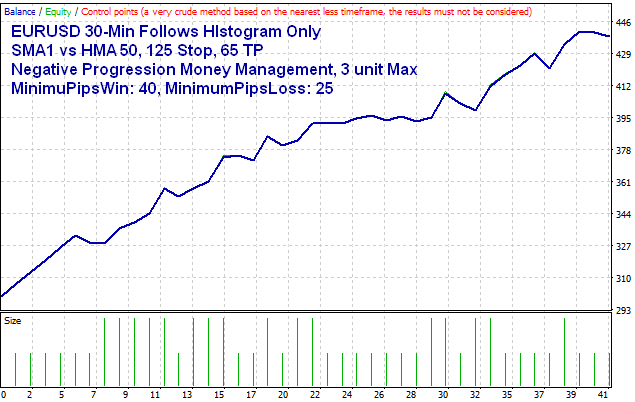 Trades Follow the Histogram: Follows the average trend of 2 or 3 pairs. Buys on Green Histogram, Sells on Red Histogram at specified strength levels. 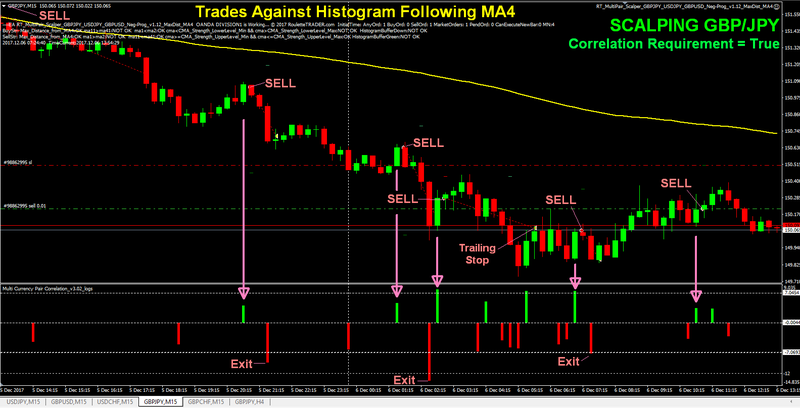 Trades Follow the Histogram AND MA4: In this EA, there is a 4th moving average that applies ONLY to the TradePair. It will only BUY when the TradePair price is above MA4 and SELL when the TradePair price is below MA4. 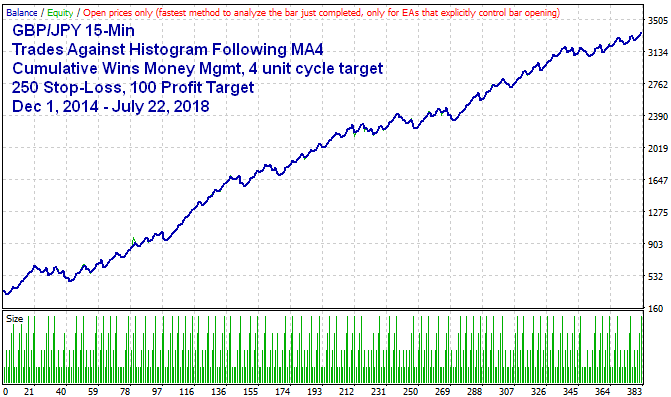 This allows you to only take histogram signals when they are in agreement with MA4 on the TradePair within a specific distance from MA4 for more control over your entry points. For example, you can trade shorter-term trends represented by the histogram in the direction of a longer-term trend represented by MA4 on your TradePair. 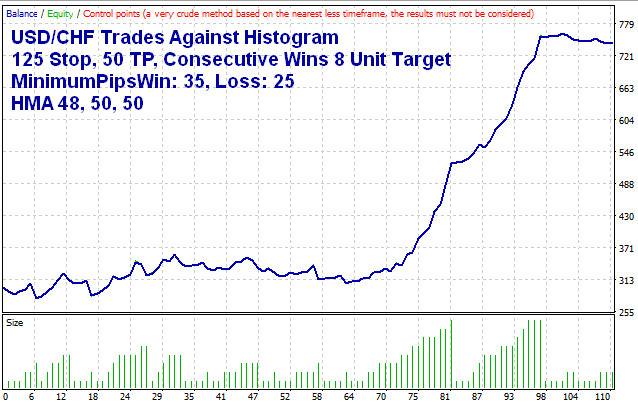 Trades Against the Histogram: Good for consolidation strategies. Buys on Red Histogram/Sells on Green Histogram at specified strength levels. See chart below. This is the EA being used on USD/JPY in this MyFXBook account. 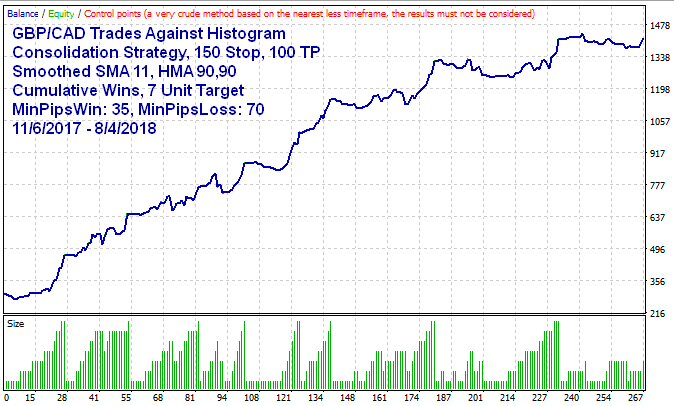 Trades Against the Histogram Following MA4: My original Scalping EA. This EA also includes a 4th Moving Average that is ONLY applied to the Trade-Pair. It BUYS on a Red Histogram when the TradePair is above MA4 and Sells on a Green Histogram when the TradePair is below MA4 at specified strength levels. 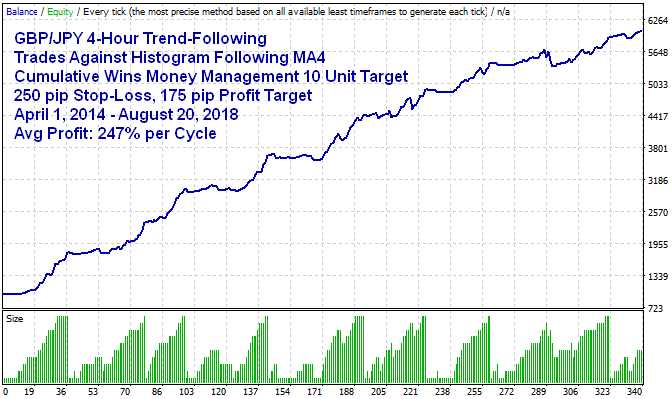 This allows you to enter on short-term pullbacks (the Histogram changing color) but in the direction of the longer-term trend (MA4) within a specific range from MA4. Example: Buy on red histogram when TradePair price is above SMA 100, Sell on a green histogram when TradePair price is below SMA 100. See 2nd screenshot below for example. This EA can precisely replicate the V2 GBPJPY 15-Min Trend-Following EA but with many more entry, exit and money management options. (See backtest further below). 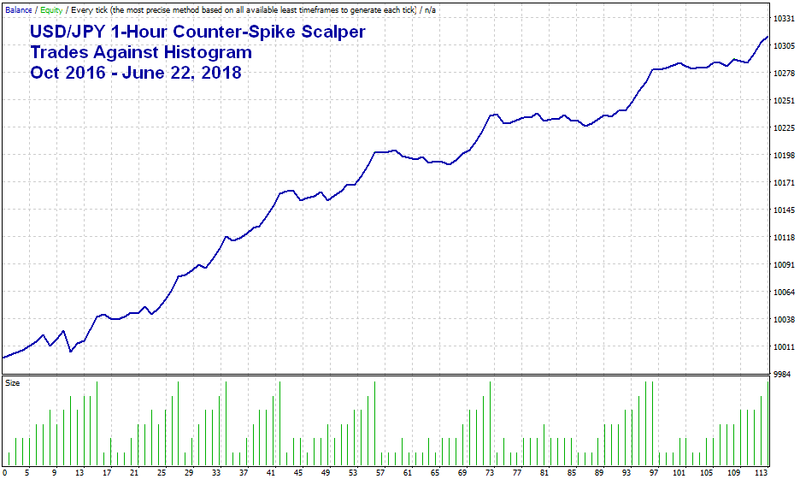 This particular GBP/JPY scalping strategy below works great in trends but proved to be too inconsistent to use long-term through choppy conditions. It seems to be best if only used during strong trends or immediately following major economic announcements like NFP. I have not tested it with different settings or the recently added HMA moving average yet. This is a 15-Min chart using SMA 117 as MA4 (yellow line) trading against 1-bar correlations of GBP/USD and USD/JPY because when these 2 pairs correlate, you usually get an exaggerated move on GBP/JPY but it is often short-lived. So, this strategy enters AND exits on correlations in opposite directions at different strengths (weaker correlations against the trend for entries, stronger correlations in the direction of the trend for exits). The moving averages used were MA1=1, MA2=2, MA3=2, MA4=117 (all Simple Moving Averages). Correlation is required so the red/green bars in the histogram only appear during correlation on that candle (potential entry and exit candles). The preset files and template for this strategy are included with this EA for 3 different time frames (15-Min, 30-Min and 4-Hour). The MT4 Strategy Tester cannot reference more than one currency pair so no strategies can be backtested that include data from more than one pair. However, if you only reference ONE currency pair in the settings, the EA CAN be backtested in the strategy tester just like any other EA. 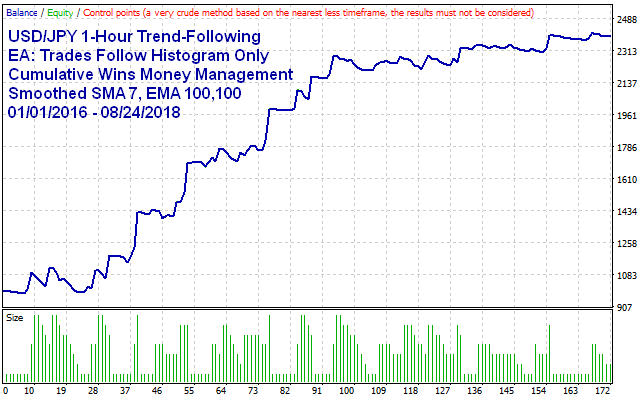 Since these EAs now include the Hull Moving Average (HMA), you can develop single-pair strategies in the Strategy Tester based on signals from the HMA indicator. Here are some backtests using the HMA. The set files for these backtests are included with your purchase and there are more set files included than what is shown below. Do you see a familiar equity curve below? 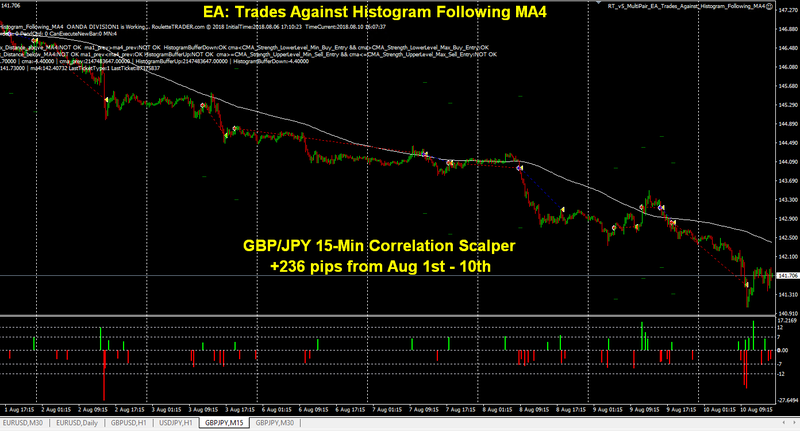 The EA "Trades Against Histogram Following MA4" can replicate my original GBP/JPY 15-Min Trend-Following strategy (equity curve on the left below) except this EA offers many more entry, exit, and money management options. 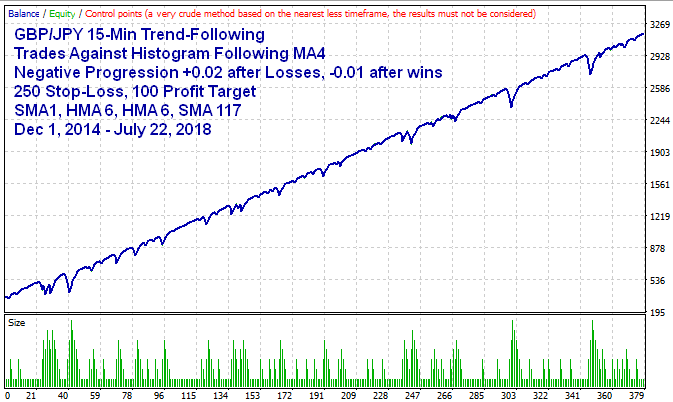 The equity curve on the right is the same strategy using Negative Progression Money Management and I changed SMA2 to HMA6. Both preset files are included. NOTE: These EAs ONLY trade the currency pair or instrument they are attached to. To trade more than one currency pair in your correlation model, the EA must be attached to each correlation pair, preferably with the same Moving Average settings so the correlations are relevant to each other. For example, if you are following the average trend of GBPJPY, EURJPY and CHFJPY with the Moving Average settings of 7,200,200, then you should use the same Moving Average settings on all 3 pairs. 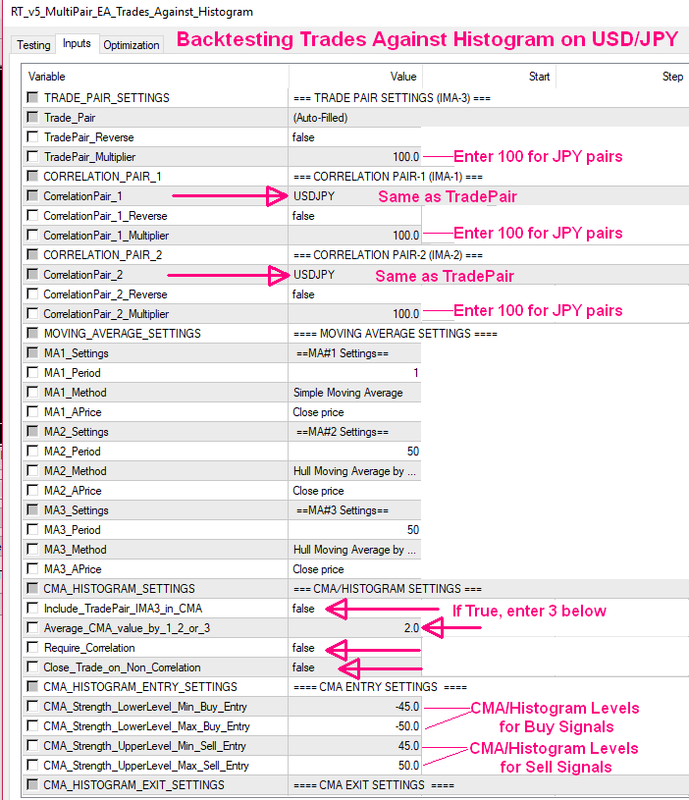 The TradePair setting is auto-filled so you only need to enter the other 2 correlation pairs in the settings, along with the appropriate multiplier setting (use 90 - 100 as the multiplier for JPY pairs and 10000 for all non JPY pairs). There is more information on how to calculate the multiplier in the Multi-Pair Indicator Tutorial. 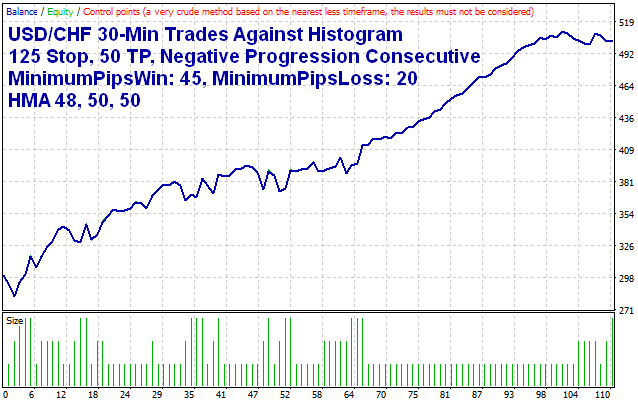 Use_Negative_Progression: True increases lots after qualifying losses (Martingale). False increases lots after qualifying wins (anti-Martingale). UseConsecutiveMethod: True=Consecutive Wins method, False=Cumulative Wins method. Minimum_Lot: The smallest lot size the EA will open. This should usually be equal to 1 unit (same as your UnitSize_Up setting below). Maximum_Lot: The largest lot size the EA will open. This is your Cycle Target. UnitSize_Up: The lot size that will be added to the previous trade's lot size (when applicable). UnitSize_Dn: The lot size that will be subtracted from the previous lot size when using the Cumulative method (UseConsecutiveMethod=False). Stay_at_Max_Lots: If Use_Negative_Progression=True, your lots will stay at Maximum_Lot on a losing streak until you get a qualifying win. If Use_NegativeProgression=False, your trades will stay at Maximum_Lot on a winning streak until you have a qualifying loss. The settings in the screenshot above are for the Cumulative Wins system with an 8 unit cycle target. It will increase lots by 0.01 lot (UnitSize_Up) following each win of 500 pippets (50 pips) or greater and subtract 0.01 lot (UnitSize_Dn) following each loss of 500 pippets (50 pips) or greater. 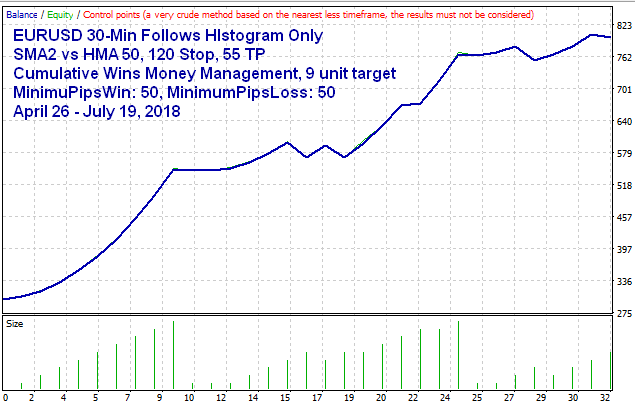 Since Stay_at_Max_Lots=false, it will default back to 0.01 lot (Minimum_Lot) after a win at the cycle target of 0.08 lots (Maximum_Lot). 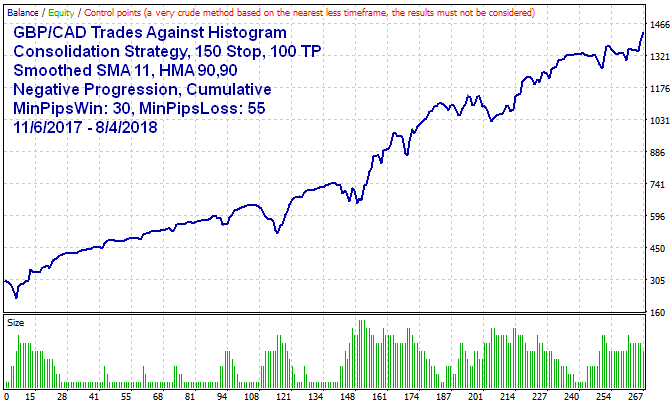 If Stay_At_Max_Lots=True with these settings, it would stay at 0.08 lots during a winning streak until there was a qualifying loss of 500 pippets or greater, then it would default back to 0.01 (Minimum_Lot). Additional Benefit: Unlike my original V2 EAs, these Multi-Pair EAs do NOT lose their unit count if you restart MT4 at any time. It calculates the correct lot size at the opening of a new trade by referencing the previous trade's lot size and P/L, as long as the magic number has not changed since the previous trade. Multiplier Settings: Enter 100 for JPY cross-pairs and 10000 for non JPY pairs that have 5 digits after the decimal place in their price like EURUSD, GBPUSD, USDCHF, EURGBP, etc. These EAs are only $59 Each or Buy 3, get 1 FREE! Login to see buy buttons below. If you do not see any buy buttons below, it's because you are not logged in or you have not purchased the Multi-Pair Correlation Indicator yet. Login Here and refresh the page. Each EA includes several EA Presets, Multi-Pair Indicator Presets, and Templates as examples to help you get started. Each EA includes a lifetime license. Source code files are not included. Want to learn more about the Multi-Pair Correlation Indicator? 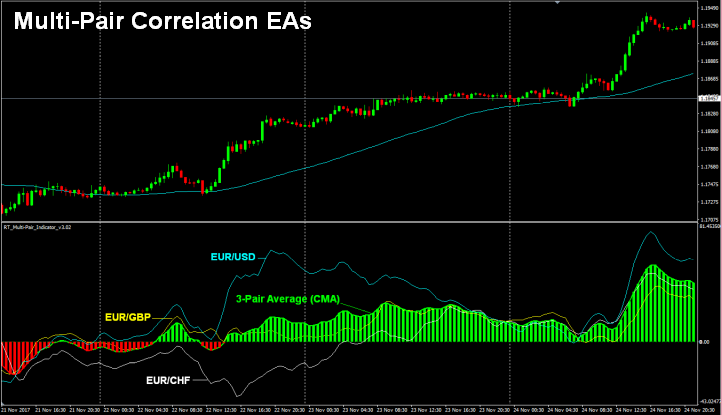 If you understand how the Multi-Pair Correlation Indicator works, you will better understand how each Multi-Pair EA works. 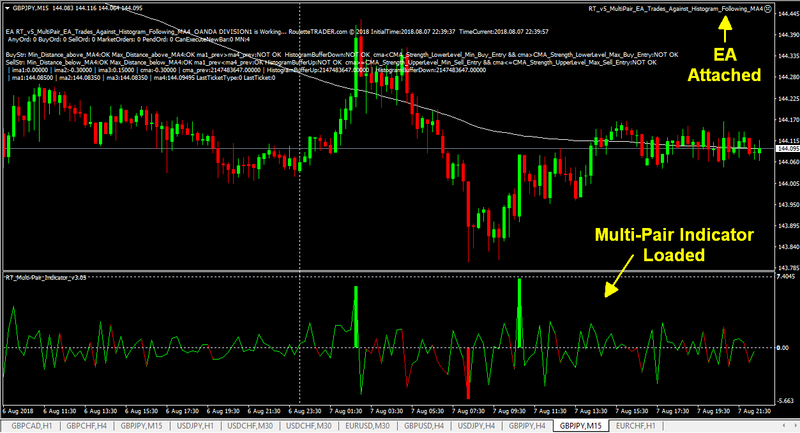 Click the buttons below to learn about the Multi-Pair Correlation inidicator. 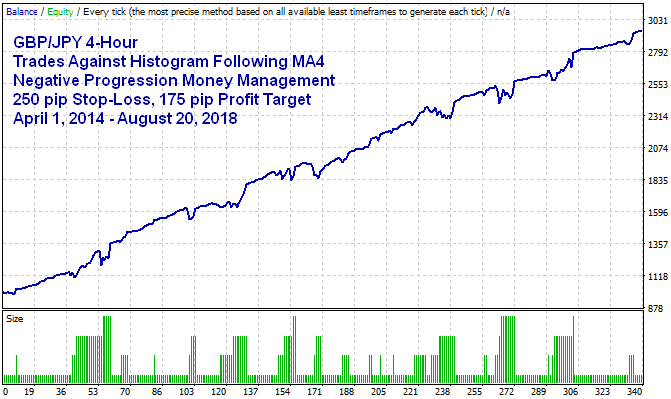 Install EA Preset files into MT4's Presets folder under MQL4. Copy the entire folders to the Presets folder in MT4 to keep the presets organized by strategy. NOTE: If you purchased more than one Multi-Pair EA, you should create a separate "EA Presets" folder for each EA so you can separate the preset files by the EA they belong to. 4. Install the Templates files in MT4's Templates folder (same directory that the MQL4 folder is on). 5. If you have not already done so, install the HMA indicator and the v3.05 Multi-Pair Indicator in the Indicators folder of MT4. 6. Restart MT4 or refresh your files in the Navigator so all new files will be recognized by MT4. To Refresh, right-click over any folder like "Indicators" and select "Refresh". 7. Open a currency pair and time frame of a Preset strategy you would like to trade. Then load the template for that strategy. Some preset files may not have an associated template but most do. 8. By loading the template, the EA and indicator will load automatically with the corresponding settings for that strategy. 9. Open the EA properties and enable Live Trading. 10. Check the Money Management settings and adjust as desired. Some strategies include multiple EA presets for different money management strategies that you can choose from, such as FixedLots, ConsecWins, CumulativeWins, NegProg (Negative Progression), or you can customize your own and save your settings as a new preset file. Risk Disclosure: This website does not guarantee income at any time, nor success of the product beyond the specific 60-day performance guarantees for each product. There are many factors that can effect each person's individual results. Examples shown in this presentation do not represent an indication of future success or earnings but merely hypothetical historical performance based on specific trading models. Past performance is not indicative of future results and individual results will vary. The company declares the information shared is true and accurate.